:Caravan Bear once again hitches up Hector the horse to the brightly painted gypsy-style caravan and, with Whitby the dog and Christopher Rabbit, set off in search of new adventures. Enjoy Rabbit's storytelling from the Old Testament along the way, interrupted with frequent questions from the travellers and other animals they meet. The Animals' Caravan, has echoes of children's classics such as Wind in the Willows and Alice in Wonderland as Rabbit leaves his home to set out on an unexpected journey - a journey to find friendship and make sense of the world around him. He also finds himself on a journey of faith as he and his new friends wrestle with some of the often difficult concepts in the bible, thereby gaining fresh insights and understanding of God's loving involvement and care for the world. The travelling life of the caravan and its occupants provide the opportunity for Rabbit to share these tales with other animals they meet and they join Caravan Bear, Whitby and Hector in listening - and learning from - the stories. He is frequently interrupted by questions from his listeners, the kind of questions any child - or adult - might ask. The real and often humorous events that happen to Rabbit and his friends are mirrored by the stories from the Bible enabling children to realise that the stories have relevance and meaning today. 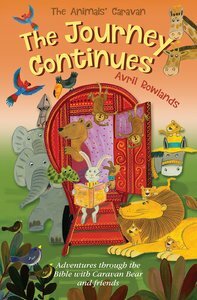 About "Journey Continues, the - Adventures Through the Bible With Caravan Bear and Friends (Animals Caravan Series)"
She worked at the BBC for many years as a PA. She has been involved in specialized training for the television industry and major film and television colleges. Her own highly acclaimed residential courses have attracted students from major television companies worldwide. She is also a writer and independent television producer.